Celebrating the sacraments is at the core of parish life and the life of faith of each Christian. Our big moments in life are marked in a solemn way from womb to tomb. Here we provide all the details for the celebration of the sacraments in our parish. Baptism is the first sacrament of initiation into the Christian community. It is celebrated in the context of community. Baptism benefits not only the person receiving it but it also builds the life of the community. Baptism is initiation into the life of Christ as we are immersed with Christ in the Baptismal waters. When we rise with him out of the waters of Baptism we are called to live a new life, to serve as He served, to love as He loved, to forgive as He forgave. Baptism begins the process of radical change in one’s life. In the words of St Paul, “out of His infinite glory may He give you the power through His Spirit for your hidden self to grow strong”. To arrange a baptism please contact the parish office or the parish priest. Those intending to marry are asked to give a minimum of 3 months notice to the Parish Priest. Baptism /Confirmation Certificates & Letter of Freedom are required. Civil Notification is to be obtained 3 months prior to marriage from Registrar of Births, Marriages & Deaths, Sandfield Centre, Ennis. Tel: 065 6868050. The Sacrament of Marriage may be celebrated in the Diocese of Killaloe on all days of the year with the exception of Sundays, Christmas Day, St Patrick’s Day and the Easter Tridiuum. Pre-Marriage Courses: Contact Accord, Clarecare, Harmony Row, Ennis. Callsave 185058500 for application form and brochure of Schedule of Course dates. Alternatively you can contact Esker Retreat House, Athenry, Co, Galway. Telephone 091-844549. Booking is advisable at least six months in advance. 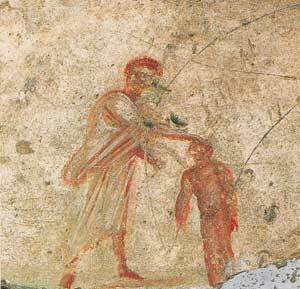 An image of Christian marriage from the catacombs of Santa Priscilla, Rome. Bishop Kieran O’Reilly SMA will visit the parish on Saturday 23 February 2013 to administer the sacrament of confirmation. The candidates for the sacrament will be enrolled during 8pm Mass on Saturday 8 December 2012. This Sacrament is available at any time by request. Special Penitential Services are organised in preparation for Christmas and Easter. Every First Friday of the month, the parish priest visits the housebound with Holy Communion. If you are unable to attend Mass due to illness or frailty and would like to be visited by a priest on the First Friday, please feel free to contact the Parish Office. The ongoing life of the church depends on vocations to the priesthood. Our diocese has a director of vocations and we’d be delighted to make an introduction for any interested candidates. Diocesan Director of Vocations: Fr Ignatius McCormack Tel: 086 2777139.